The two were poles apart. Maharaja Pratap Singh was the king of the state of Jammu & Kashmir hailing from the famous Jamwal Rajput clan. Krishna Joo Razdan was a small landlord in a small village of Kashmir, born and brought up in a Kashmiri Pandit family. The only commonality about them was that both were born in the year 1850, the former at Reasi and the latter at Vanpoh. The other related commonality was that in both the cases, some regard 1948 as the real year of birth. One was a wise ruler with great concern for the people and a keen interest in the development of the state. The other was a village head that had blossomed into a poetic genius and was also prone to saintliness. How the two met and became instant admirers of each other is obviously a matter of chance. Krishna Joo Razdan, the renowned saint-poet of Kashmir, was married into the well-known Kaul family of Vessu, a small village off the National Highway leading to Srinagar, roughly midway between Quazigund and Khannabal, two tiny townships again on the National Highway leading to Srinagar. The well-known Kauls had traditional access to the durbar of Maharaja Pratap Singh. Kauls were prone to flaunt the poetic genius and the astrological prowess of their son-in-law, among the king's courtiers in the durbar. Once it so happened that a cousin of Maharaja Pratap Singh, himself a ruler of Poonch, fell seriously ill. The Maharaja was, naturally, very worried. A pall of gloom fell upon the durbar in Srinagar. Kauls were summoned from Vessu and dispatched to Krishna Joo Razdan (KJR for short) to give his astrological advice. KJR thought for a while after making some calculations and advised that the king be advised to do "anna daan", (offering of food) indicating that his days were numbered. By the time this message was carried to the Maharaja, he had received a telegram stating that the health of his cousin King had shown signs of improvement. The Kauls went back to KJR for consultation. KJR reiterated his earlier advice of "anna daan" and when they reached Srinagar again, the Maharaja had received another telegram stating that his cousin and King of Poonch was no more. When this story reached the ears of Maharaja some weeks later, he expressed his desire to see KJR, who, as stated earlier, was also a landlord and doubled up as the village head of Khirmani-Ganesh Raina, the landed jaagir named after his father, Ganesh Raina, in the state revenue records. Since the annual festival of Mata Khir Bhawani was round the corner and KJR was an ardent devotee of Maej Raagnya Bhagwati, as Kashmiri Pandits would call her, a meeting was arranged on the sidelines between His Excellency, Maharaja Pratap Singh and Krishna Joo Razdan. Formalities over, the first question that the Maharaja is said to have asked of KJR was as to whose pooja would the king perform as a morning ritual. Pat came the reply, "Shiver" - a bird whose worship is believed to bring good luck to the rulers. 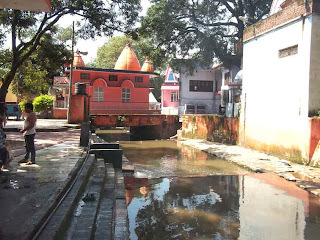 Surprised though, but without looking so, the shrewd Maharaja told KJR that he would accept him as a saint if the colour of the water of the spring holding the statue of Mata Khir Bhawani would change there and then. It is said that KJR instantly won the respect of the Maharaja; because the water changed its colours as His Excellency, the Maharaja had wished. Dal ma hasha tseta kiya pamposh chhaaw"
This bhajan described the entire Kashmiri advait shaivite philosophy while drawing parallels between the spiritual terminology and the names of the things that abounded in and around the dal lake. 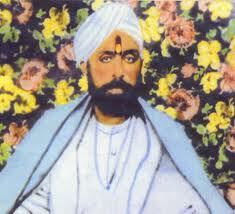 The instant use of the sweet metaphors, similes, alliterations and assonances in the musical quatrains devised on the spot had gone a long way in establishing not only his spiritual authority but also in regarding him as a "poet of poets" for the simplicity of language that demystified the Kashmiri shaivism and his style started being copied by his contemporaries and his juniors. It is said that KJR never visited the Maharaja in his durbar. Nor did he ever ask for any favour from the King. This was apparently because KJR was a firm believer in "Prarabdha" or what we, in common parlance, call destiny, about which he has written eloquently in so many of his beautiful poems. Only when the Maharaja would travel from Jammu to Srinagar or vice-versa, would he either visit KJR at his home at Vanpoh, KJR's native village on way to Srinagar; or simply send for him a "Nazrana" as a token of respect, that, as they say, was usually an amount of Rs.11/- accompanying a basket of the seasonal fresh fruit or almonds and cardamom. The river Devika is considered to be one of the most sacred rivers in our scriptures. In other words this river is called as Ganga of Duggar. Inspite of the fact that this river flows down in Jammu region of J&K state some scholars express their divergent and controversial opinions regarding its identity and actual location. According to Dr. Vasudeva Sharan Agrawal, this is a sacred river of Madra Desha (an old name of the land of Dogras) which starts its course from the hills of Jammu region which is called as "Sahasra- dhara" near Suddha Mahadev temple and flows down towards western Punjab (now in Pakistan) where it merges with the river Ravi in Pakistan. It is said that during rainy season it irrigates a major part of its vicinity in Pakistan before it merges with Ravi due to which that part of the land has become much fertile for the paddy crop of the best quality called "Vasamati". This is the peculiarity of this river that except in rainy season it mostly flows underground only. Dr. P. V. Kane (Bharat Ratna award winner) differing with Dr. Agrawal opines that this river can be identified with Wullar lake in Kashmir valley. But this is not a correct statement of Dr. Kane, as in Wullar lake only the river Jhelum falls which gets out of it from its westernside. Nandu Lal Day identifies this river in his treatise- 'The geographical dictionary of ancient and medieval India', with river Saryu. But Vana and Anushasana parava of the Mahabharata confirm that Devika and Saryu are two different rivers flowing at different places. The Vamana Purana refers to it at two places. Confirming it as Devika Tirtha. In Varah Purana this river has been referred to some what more expressively - "Devika nam devanam Prabhate tapasyat niyamartham samudbhava Gandakya militashubha." The river known as Devika has emerged for the sake of Gods who perform their penance earlier in the morning and ultimately merges with river Gandaki. This reference creates a complicated problem as far as its actual identity is concerned. According to the majority of opinions, it is clear that Devika merges with Ravi and not with so called Gandaki. In his translation of the Martanda Purana. Mr. Pargiter identifies Devika with one small river Degh. Mr Jagannath also supports this view which subsequently has also been supported by Dr. Kane even. 'Prabhasa mahatmya' also has given an information of one Devika river which flows near Mulasthan (modern Multan in Pakistan) which definitely refers to a different river. The Nilamata purana however, gives a detailed description of this river which according to the same is one of the sacred rivers in Madradesha. This purana says that Uma (the consort of God Shiva) herself had adopted the shape of a river which had become popular as 'Devika' and made its course between the river Chandrabhaga (modem chi nab) and the riverIravati (modem Ravi). Both Panini and Patanjali (the great sanskrit grammarians of ancient times) refer to this river in Ashtadhyayi and Mahabhasya respectively. (Devika Kulodbhavah shalayah). The paddis growing at the bank of Devika are ofthe good quality. In addition to the above, this river has also been referred to in Brahmanda purana, Vayu purana, Narada purana, Visnu purana, Skanda purana, Padma purana, Brihadaranyakopanisad’ and Kathopanised. In view of the above, it is clear that the river Devika is one of the most pious rivers in our country and only that is the real Devika river which flows down in Jammu region of J & K state known as Duggar (madra desha in ancient time). Therefore, Panini, Patanjali, Visnu Dharmottara purana and Nilamata purana correctly record their references regarding this river. Therefore, the conjectures of other scholars are automatically nullified. This sacred river starts from the hilly area in the vicinity of Suddha Mahadeva (called Sahasra-dhara) and flows down towards Pakistan covering a distance of about fifty miles. God Shiva himself explains as how Devika emerges from Sahasra dhara. yatra devi mahagouri Pradurbhuta sahasradha. yasmat girivarat jata, devika jyoti rupini. madagaya madra prithivim sapta sagar mekhalam. She being my half partner and also as my energy always staying in my body, therefore following my advice she adopted the shape river 'Devika' for the welfare of great Madra country. The significance of this river is that right from its origin up to Purmandal a pilgrimage at its banks about 27 k.m. north-east of Jammu city, it is visible only at a few places. At Purmandala, however, it takes the shape of a small river but except rainy season there too its water mostly flows under-ground. Whenever people want to take bath they have to dig pits by which water comes out. Probably of this very reason the great commentator of Paninian grammar (Ashtadhyayi) vamana and Javaditya define “Devi-kayam Bhavamudakam Devikamudakam” water which comes out in Devika is called Devika water. In case of other rivers we seldome find such peculiar statement or interpretation as in rivers water only flows and not comes out from their bottom. Thus only Devika possesses this peculiar characteristic. Whenever any body goes to this river, he apparantly sees only the wet sand bed everywhere and to his astonishment water comes when he digs a pit there. On account of Devika's sacredness, it is respected like sacred Ganga. The people therefore, do not collect ashes of the cremated dead bodies at its banks. Since this river turns its course facing northward at a particular place, it has been named as Uttara vahini by which that village also has become popular as Uttar Vahini. Right from Udhampur to Vijaypur, we find several old temples or pilgrimages at its bank which establish its sacredness and popularity as a pious river. Really, it is a symbol of our culture, especially that of Duggara's culture. We, the Dogra people are proud of this Ganga of our land. Late Maharaja Ranbir Singh, a protagonist of Indian culture had planned to make a second Kashi in the area stretched from Purmandal to Uttar Vahini by erecting several temples and running a Sanskrit Pathashala at the bank of Devika. But his untimely death deprived the people of Jammu region of his so sacred plan. Had late Maharaja Ranbir Singh's that missionary programme been continued further by his successors even till completion, the entire area from Purmandal to Utter Vahini would really have become a second kashi as dreamt of by that great king of this state. "Go home,” he said, "the path is extremely difficult!” The Pir lay back on his sheepskin and turned on a tape of Kashmiri Sufi songs. I sat quietly with my friend and our translator waiting for more of a response. The Sufi Pir we were visiting was a middle aged man who had been on the spiritual path for almost twenty years. We had heard that his teacher was a Qalandar whose reputation for holiness, miraculous ways, and elevated states, was known throughout the Kashmir Valley. I knew I had to meet such a holy man. I was adamant and I hoped this Pir, who was one of Baba’s long time students, would give us his blessing to go. This etiquette felt important, although at the time I wasn’t sure why. I had been in India for almost one year, yet something within me said it wasn't time to go home. As I anxiously awaited the Pir’s response I listened to the repetitive melodies and foreign words flowing out of the cassette player. Questions about the Sufi path and memories of my encounters in this exotic land whirled about in my head. Was Baba Sultan the spiritual guide I had been seeking? Finally the Pir sat up, methodically scribbled a note, handed it to me and spoke abruptly to the translator. Then he reclined again, closed his eyes and fell back into his music. The note, the translator explained, was to be given directly to Baba Sultan. It was a courteous formality from student to teacher requesting that Baba accept my petitions. From Srinagar it would take about four hours by bus, or a little over two hours by taxi to reach Badasgam, Baba’s village. We opted for the taxi. Our translator tried to dissuade us: "Qalandars are very powerful, different from 'normal' people. Their speech is difficult if not impossible to understand. Even if I could translate his words, he speaks in symbols and…" he shook his head. “I can take you to Shalimar Gardens and then show you Srinagar's many other beautiful tourist attractions." He continued with great vigor, trying to discourage us from going to Badasgam. When the tourist attractions did not interest us, he began describing Baba's unusual "shabby" clothes and the Dervish's uncanny "way of knowing what is in people's hearts.” This only fueled my burning desire to meet Baba Sultan. As our translator spoke it became more and more evident that he was in awe of, but also feared the power of this Qalandar Sufi. After we had refused all of his suggestions, he finally agreed to come with us to Badasgam and translate (as best he could) the words of this awesome holy man. We arrived in the village that same evening. As we stepped out of the taxi, several people walked over to us. They told our driver that Baba was expecting us. Even though there were no telephones or telegraph offices near by Baba Sultan had told everyone that we were coming. He had no need of technology to keep track of things! There were many people mulling about inside and outside of his house. Baba was in the kitchen sitting on the dirt floor, eating rice. The powerful presence emanating from him permeated the room. Although the dervish was literarily surrounded by people, he looked inwardly engrossed and completely peaceful. Yet, at the same time he was obviously aware of everything that was going on around him. People were talking to Baba (sometimes more then one at a time) telling him their dilemmas. They sought help for physical ailments, financial difficulties, family issues, ailing farm animals, and even damaged crops. Sometimes Baba responded verbally, but after he uttered a few words his attention would return inward. Sheikh Sultan often appeared to be focused far beyond his physical surroundings. Baba spoke infrequently. When he did converse he used symbols, rarely addressing a problem with a direct or analytical solution. I was to find out that most people admitted that they didn't understand the meaning of his words. The language of symbols that Baba used was powerful, all encompassing. I later came to understand that a symbol has a specific meaning to a student at the time it is first mentioned. Then, as the student grows and develops the symbol remains with him/her, expanding, changing and unfolding into new meanings. As one's understanding grows and changes, so too does the meaning of each particular symbol. Thus, the language of symbols has a power all of its own. This form of communication has been used as a teaching tool down through the ages. The prophets used it in parables and prophesy; the holy books of all religions use it. It is the speech of the most holy and Baba Sultan had mastered its dialects. Even though most people admitted that they didn't understand the meaning of Baba's words, they came by the hundreds, telling him their woes and begging for his help. All who came were comforted in some way! As this particular night progressed some people left but many remained. The villagers told us that Baba Sultan was never alone. Even while he slept, he was surrounded by people who camped in, and around his house. Still, Baba’s deep sense of inner peace was evident; he was in reality, alone with God. As I stood within the throng of people looking at this unpretentious saintly man, I realized that I needed to devise some way to get closer to him. I wanted to speak with him directly; but how? There was no "orderly" way to take my turn, no lines; no place to make an appointment. I simply had to watch and wait until the perfect time presented itself. At last Baba rose and went into the other room. I followed him hastily trying to surmise where he was going to sit. I planted myself on the dirt floor hoping I had made an accurate choice. Baba looked around and then to my great relief, decided to sit just where I had hoped he would... a few inches from my chosen spot! Of course there weren't any chairs. This was a village house and everyone, including the Sheikh, sat on the dirt floor. Seconds after he sat down people surrounded him, leaving few if any gaps for those unlucky enough to be on the wrong side of the room. Then, as was the custom, those close began grabbing for his hand and crying out their pleas. Again, there was no apparent orderly way to make a request. I was overwhelmed by the number of people reaching for Baba’s hand. Yet, there I was amongst them, sitting as close to the Sheikh as I could get, waiting for the right time to take his hand and communicate my requests. Baba reclined peacefully on the dirt floor while people clasped for his right hand. Some shed tears without words, while others blurted out their problems. The Dervish simply allowed his hand to be pulled from person to person, listening and occasionally speaking words or phrases that few, if any, comprehended. The only consistency within the seeming chaos that surrounded me was the extraordinary power and love that emanated from Sheikh Baba Sultan's presence. I watched patiently as Baba patted each person's hand, before clasping the next. Finally I made my move. I swiftly handed Baba the note I had received from his student. I was the only "foreigner" in the room and many were curious to see what Baba would do with the note. Baba examined my "letter of recommendation." Then, he tucked it away into one of the cloth pouches he had made. After that, I too, reached for his hand. As I felt Baba's fingers close around mine, a deep sense of peace encompassed me. The noise, the heat, all the discomfort was meaningless now. I wanted to suspend this moment in time, for I knew I had truly found a "Wali Allah." Suddenly, Baba spoke to me, without words, yet the meaning was clear. His communication was as lovely as a frequent breeze, yet as powerful as a clap of thunder. As I tightened my grasp, the cries around me, the dusty dirt floor, the candlelight, all faded away and there was only peace. After sometime (I couldn’t say how long) I felt someone grabbing at my arm, trying to pull my hand away from Baba’s. Baba told me wordlessly to hold on tight, which I did, and our communion continued. Finally Baba whispered something out loud. His few words were filled with love and I knew it was time for him to help another. He patted my palm gently as I released my clasp. Immediately the person next to me grabbed his hand. But, Baba had not really let go of mine, and I knew he never would. And so it began! I finally found my teacher. I had "taken hand" and been accepted. Throughout my sojourn I’d met a wide range of spiritual teachers, but not one of them had beckoned to my soul. Not one of them was able to reach deep into my heart as Baba had instantaneously done with the touch of his sweet hand. My way was finally clear. In this little village, among people I could barely understand my teacher had been waiting for me, as I had been for him. We were together at last! The night progressed, but I was lost in peace. As we drove back to the hotel I smiled to myself. My spiritual guide was to be a “God Intoxicated” Qalandar. I would get no classes, no lectures, and no written treatises from him. To the westerner's logical way of thinking this was like a puzzling dream. And yet, to me, it was perfect, exactly what I needed! As we road back to Srinagar, I reviewed every detail of Baba’s appearance in my mind: His patched, worn clothing; the pieces of cloth that he had tied into pouches, after filling them with bread, fruit, sugar, tobacco, candy, or other little treasures. I recalled how Baba had distributed these pouches with great care. Each item had a practical use and a symbolic meaning. If the recipient was aware, he or she would understand the significance of both. On my subsequent visits to my Sheikh, I would often ponder specific questions in my mind. Baba usually answered them immediately upon my arrival, without me uttering even a single question out loud. Yes, the answers were usually given in symbols. But these symbols were alive and not confined to any one point in time. Therefore, they constantly offered new answers and insights. I often marveled as I watched Sheikh Baba Sultan read people's hearts, respond to hidden thoughts, and answer unspoken questions. As all seekers know, there is no end to a story, after the teacher has been found. There is only unfolding, movement, expansion, and the everlasting love that comes from God through His friends. As one progresses there are chapters upon chapters, and often there are no words adequate enough to express the depth of the journey. May Allah's Peace and Magnificent Blessings be upon our beloved Sufi Teacher, Baba Sultan." Sheikh Muhammad Sultan is a 20th Century Sufi. He lived in the valley of Kashmir, in a small village called Hakura Badasgam in Anantnag District. Stories of his miracles are known throughout the entire state of Kashmir and beyond. Baba Sultan was a Qalandar. "Since such Sufis (Qalandars) had dedicated themselves to God and trusted only in Him, they tended to ignore all outward socially accepted norms, so long as ignoring them did not involve breaking the Shari 'ah or Divine law. (They dressed unusually and carried various items... this seemed to set them apart from other people.)" Although there is much written about Qalandars in other languages (Urdu, Persian, Arabic etc. ), there seems to be little written in English about this line of Sufism. There are as many different expressions of what it is to be a Qalandar, as there are Qalandars themselves. Qalandars vary as to their spiritual states, stations, mystical, and metaphysical awareness. But the one thing they all seem to have in common is a lack of concern for social norms. They respond to God's call in their own unique way. And, if that "way" does not fit into society's norms they follow it regardless, unconcerned and unencumbered. We refer to the Sufi Silsila (Line) of Qalandars as Silsila Qalandariya. It is to this line of great Sufis that Sheikh Muhammad Sultan was called. Baba Sultan began his adult life as a rice farmer. He was married and had two daughters. When his children were still very young Baba began showing signs of Qalandar-like behavior. This greatly concerned his wife and family. But, their concerns did not hamper God's call. Muhammad Sultan Sahib accepted the Sufi Way. It was not long before his healing powers became evident and people began flocking to him. His home was no longer a quiet village household. Instead it was filled with townspeople, pilgrims and seekers of all religions and backgrounds. Hundreds of people came to Baba; he never turned anyone away. Everyone who asked received his help. Through all the hours of the day and night, Baba was surrounded by people. They literally "camped out" on the floor in his home, on his veranda, or anywhere they could find space. Baba Sultan's compassionate help was not limited only to people. Animals were also treated with loving kindness and care. Quite often sick dogs, cats, birds, sheep, cows, chickens, goats, etc., found their way to Baba's home. He exhibited deep loving care and compassion for all of God's creatures. Physically Baba looked thin and frail. However, he had incredible strength. To be in his presence was to be in the awe-inspiring atmosphere of a "Wali Allah" (Friend of God). Baba was a reader of hearts. One did not need words to convey personal needs and desires to him. Baba knew people's thoughts without the use of verbal communication. He was aware of what those who came to him wanted and needed. He spoke little. When Sheik Sultan did speak he often did so using the language of symbols. Some understood many didn't. Whether they understood his language or not each and every one received something beneficial. Baba would not give visitors "permission" (his blessing) to depart, until their need had been addressed and help had been given. Baba Sultan was a beacon of light, a teacher, comforter and healer; above all ,A LOVER OF GOD and a blessing for all of God's creation. Today people continue to visit Baba Sultan's home. His shrine (which has been re-built by those who love him) is situated on the same land that welcomed thousands of seekers in his lifetime. In August of each year people come from all over to celebrate the memory of their beloved Baba. His presence is still felt by all who love him; and Baba Sultan continues to live on in our hearts. Amidst this grand unfold of vivid beauties, the mountains, the streams, the meadows and therefore the snowline of Himachal are a real spectacle which will inspire several a artist - be it poet, painter or thinker. A drive on the Manali Keylong Leh route passing through the high altitude of Lahaul and Spiti district of Himachal Pradesh offers a mix of all this and far a lot of. A travel on this route is nothing however a poet's delight and a photographer's heaven. Given the adverse road conditions and unfavorable weather, one wants a passion to venture into this one in every of the foremost difficult roads of the country. it's advisable to hold full winter gear in all weathers. the primary encounter with unpredictable weather will begin as early as Solang valley, barely ten km out of Manali when the intense, radiant Sun is overshadowed by a dark cloud among seconds. Travelers typically take the primary halt at Marhi, which, besides being a chai-pakora station, is additionally the reporting centre for all vehicles plying on Manali Leh route. when a hot cup of tea and paying obeisance at a neighborhood temple, one moves ahead on the foremost mesmerising ascent of the journey - the large Rohtang Pass that stands tall at 3979 metre on east Pir Panjal vary. Gorges and colossal rocks scare the challenge the travelers on one facet whereas a huge Himalayan vary casts a spell on the other! Maneuvering several needle-shaped turns, with slopes exceeding forty degree, and encountering lonely stretches, abundant hustle and bustle awaits the guests atop Rohtang. The Pass, that in Tibetan suggests that a pile of corpses, leaves everybody awestruck with its grandeur and humility!! The Himalayas, that look gigantic upon ascent, bear a noticeable check up on the Pass. Altitude is that the sole indication of enormity. The mountain, though huge, stay humble before humans atop! The Pass, notorious for its unpredictability, is additionally known for Beas Kund - a spring - the supply of river Beas, that originates subtly beneath a blue and gray closed structure. many serene moments at the Beas Kund convey that rivers, but fiery, have a humble origin! Humility is best taught there than elsewhere! A few turns later, one encounters an area with several flags. At 4111 metre, this can be the very best purpose of Rohtang. Vendors usually crowd there with stalls for chana-kulchas. Who will resist these hot, nee warm, snacks within the biting cold and chilly breeze? Alongside, one also can get pleasure from ride on the newly introduced all weather bikes, giving a feel of a mini journey sports arena. The real beauty begins beyond Rohtang, where the character unfolds its mystique, virginity and purity! The lofty Himalayas appear to be kissing the sky. attributable to high altitude, the Sun gets therefore shut that the shadow of clouds is clearly seen on mountains - a rare spectacle, that deserves to be aptly captured. One will witness the distinct amendment in vegetation. The tree-line gets away, creating means for little bushes. The mountains become naked, sandy and rocky. within the absence of thick forestry and reduced distance between ground and therefore the sky, the sharp glare of the Sun makes the donning of goggles inevitable. A few kilometers later, one enters Khoksar, the primary village of Lahaul Valley. The stopover, at the bank of river Chandra, gift a typical hill facet atmosphere - a river bank, a suspension bridge, a large naked rocky mountain, bad road, a PWD Rest house alongside and little roadside outlets giving paranthas, noodles, momos, rice and Siddu, a neighborhood dish. One have to be compelled to push in one thing, as this can be the sole major stop on this road, before reaching Keylong. As one moves deeper into the Lahaul valley, the terrain becomes therefore lovely that one forgets the displeasure of travelling on unmetalled roads. At several places, mountain streams flow over the road whereas at several alternative places, the pot holes, accumulated rainwater, landslides, bumpy tracks are the sole signs of what we have a tendency to decision a 'road'. Unmindful of this, one should get pleasure from the grandeur of Himalayas, interspersed with waterfalls, streams, rocks and gorges. Wild roses and alpine flowers deck the slopes in an unforgettable feast of colors. Suspension bridges add excitement to journey. Atop one such bridge, one will see the gorgeous Sissu fall cascading over the cliff from a high valley between 2 mountains. Crossing another bridge takes one to Tandi - the confluence of rivers Chandra and Bhaga. From here, the 2 rivers travel in unison as ChandraBhaga. The meeting purpose, with rocky ranges and a noticeable village Ghoshal within the background, is therefore spectacular that it seems in promotional images for this region. Mountains, rivers, plains, greens all meet at one purpose and make a wide ranging show of the richness of nature. when humility, unity is another lesson taught by Nature on this route! Legends add feather to the present natural crown of Tandi. it's believed that the wedding procession of Lord Shiva, passing through the tall mountains, had left sinusoidal imprints, visibly distinct from alternative impressions on this vary. There are alternative mythological stories concerning Draupadi and Rishi Vashishta. Tandi is alleged to possess return from 2 words 'Tan Di', i.e. Rishi Vashishta is alleged to possess relinquished his body at this time. Travellers got to high up their tanks at Tandi, that has the last fuel station before Leh, another 365 km from this place. Spending moments of leisure at Tandi, one drives ahead for Keylong - a reputation that ignites passion and challenge; a reputation that epitomizes undaunted human spirit of living in frozen conditions and virtual solitude. For travelers wanting to travel beyond, Keylong is that the ideal place for an evening halt, because it is headquarter of Lahaul and Spiti district. Besides a HP Tourism Hotel, Keylong has several personal hotels. One will visit nearby Udaipur valley or proceed towards Leh, through the gorgeous Jispa valley and therefore the famous Darcha valley. Keylong city additionally includes a little monastery besides a neighborhood market (called because the Mall - equivalent to the other hill station!) that sells things like woolens, handicrafts and olive oil. Whichever direction one takes consecutive morning, one cannot afford to miss the eternal charm of a dawn in Lahaul. "Nature's 1st inexperienced is gold, her hardest hue to hold; her early leaf's a flower, however solely therefore an hour." One will anticipate to the journey beyond, absolutely overcome by the paranormal nature - indeed unbelievable and unfathomable! Though we see Dogri Poetry's birth in Rama Datta Bhadwal's (popularly known as Dattu belonging to 2nd half of 18th Century) poetry so for a traced only in two couplets. He was basically a renowned poet of Braj Bhaska (language) There after, similarly Lal Ram Dhan,Ganga Ram, Mathara Dasand Kanshi Ram (known as Pahari Gandhi) also composed some Dogri couplets, but not so systematic poetary or any thing in prose. After a long interval, however, it was only during Maharaja Ranvirt Singh sign that Dogri language got a royal patronage and it was declared an official language along with Persian language. However, by the order of the Maharaja, its then prevailing script was modified and improved also. All the Government notifictions and orders used to be issued in this language alongwith Persian. It also got place in the revenue stamps, postal stamps and currency notes etc. Some important books of the other languages were also translated into this language, Lilavati being however, one of them, as it is most important book on Mathematics (in Sanskrit) which was translated by Jyotishi Visheshwar. But alas, after the sudden death of that great Dogri ruler during 1886. (AD) Dogri had vitually become orphan. No body did take care towards its declining status and the Urdu language becme dominant alongwith English. Again it was during middle thirties that we see that Dogri reopened its eyes in Pt. Har Datta's poetry like- "Adalti da dhanda", Vishwa nath Khajuria's one act play- 'Achoot' Dinu Bhai Pant's Guttalu, B.P. Sathe's short stories, but this all was scanty and scattered approach which hardly could fulfill the conditions for the all round development of Dogri literture. It was however, with the advent of Prof. Ram Nath Shastri when Dogri's renaissance period re-started. He gathered some serious friendly personalities like D.C. Prashant, Pt. Sansar Chand, Baru, Dinu Bhai Pant and Narayan Mishra etc. and on the auspicious day of Basant Panchmi during 1944, the Dogri Sanstha was established with a solemn declaration for the development and growth of Dogri language and its literature. Just after that in an informal meeting of the Sanstha Pt. Sansar Chand Baru was nominated as-its first founder president and Prof. Shastri was nominated its first founder general secretary, who proved to be the main and leading source of inspiration for others especially for the talented younger generation. In order words it is to be pointed out here that with the inception of Dogri Sanstha a systematic movement under the inspiring, dymanic leadership and guidance of Prof. Shastri was started very vigorously. With the result several young poets and writers of Hindi and Urdu started turning towards Dogri. Amongst them however, the names of Ved Pal Deep, Kehari Singh Madhukar and Yash Sharma etc are particularly to be mentioned here, though writers lke B.P. Sathe, J.C. Sathe and Ram Kumar Abrol etc were also joining simultaneously. Born on 15th April 1914 to a Khajuria Brahman parents at Madi village near Reasi town in Jammu division, his father Sh. Gouri Shankar Khajuria was a renowed Ayurvedic Physician in his area, but unfortunately he could not carry on his practice properly in that area. He therefore, decided to shift down to Jammu city alongwith all family members and settled in Karan nagar Mohalla of the city where his luck however, started bringing fruit, Since, his father wanted his son Ram Nath to adopt the Aurvedic Profession like his, he decided to get him admitted in a Sanskrit Pathshala being run in the premises of Ranbir High School, Jammu. After getting preliminary education in that pathshala he got admission in Sh. Raghu Nath Sanskrit maha vidyalaya, Jammu, which was a pioneering institute for the learning of Sanskrit during those days. He passed his Shastri (Hon. In Sanskrit) followed by Prabhakar (Hon in Hindi) BA & MA (Sanskrit) examination all from the Lahore, University respectively. Thereafter, he joined as teacher in Rajput High School, Jammu. He served in that School for 5 years. During that period he solemnized his 2nd marriage as his first wife had since expired. His 2nd wife Smt. Sushila Devi proved to ba a very dedicated life partner for him who always had been a source of inspiration for him. He joined as lecturer in Sanskrit in the prince of Wales college (now known as Gandhi Memorial Science College) Jammu, the post-vacated due the retirement of a world famours linguist Dr. Siddherhwar Verma. While serving in that College when he was asked to supervise the Hindi Section of the college magazine-Tawi and also to guide the students accordingly, a question struck in his mind that Dogri even being the mother tongue of the Dogra community why was not finding any place in the college magazine. Then and there he decided to do some thing for the development of that language and literature. As already said in the preceding paragraph he took an initiative to establish Dogri Sanstha with the help of above mentioned five stalwarts. Though previously he used to write shortstories and essays etc in Hindi only then by switching over to his mother tongue Dogri he by and by started concentrating in Dogri writing also. Prof. Shastri by giving impetus to the spirit of renaissance of Dogri language for the benefit of Dogra community he made them understand the beauty of their mother tongue. Thus, he worked tirelessly to promote this language by writing in different genres of the literature of this language as well as by propagating it in different fields. Not this much only he also presented an ideology that he believed in getting rid of out dated and old values and welcoming higher values like fairness, equality and individual self pride. His many writings have enshrined in them satire and irony as he vigorously exposes the duel character of many people in the society. He has always made emphasis on writing biographies of those Dogra heroes who always challenged the establishment and followed the path of justice and virtues. In short his basic ideology was progressive one enshrined with rich Indian tradition. Again it was due to his convincing power that he made Dr. Karan Singh agreed to donate two kanals of land in Karan Nagar for the construction of Dogri Bbawan which is now getting a big building's shape. Prof. Shastri also alongwith his friends to approach Sahitya Akademi's chairman for recognizind Dogri as a literary languate and then too with the recomendation of Dr Siddheshwar Verma, Dr. S.K. Chatterjee agreed to recognize it during 1969. 2) Badnami Di Chhan - A collection of Dogri short Stories 1976 AD. 7) Bawa Jitto- Dogri play based on the life and sacrifice of a legendary Dogra hero. 8) Jhankdian Kirana a- A collection of sic one act plays. He also translated array of many prominent works intoDogri from the different language such as Sanskrit, Hindi Bengali and English books to further the richness of Dogri languages literature. 6. Mahatma Gandhi's autobiography - My experiments with truth. 7. Vinova Bhave's Gita Pravachan. 10. Gorki's lower Depths as Patalbasi. Apart from the above Dogri- Dogri dictionary's editing works as a Chief Editor, he also edited works are considered to be of high standard during 1970. On the occasion of the Silver Jublee Celebration of Dogri Sanstha, he edited the 'Rajat Jayanti Granth' in which standard research oriented articles on Dogra culture, art, social life, literature and history were included. All the articles were written by the renowed and eminent scholars of Jammu region. 1) Sahitya Akademy award for his short story - Badnami Di Chaan during 1977. 2) Sahitya Akademy's translation prize in 1989 for his translation of Sanskrit drama Mriccha Katikam as "Mitti Di Gaddi". 4) State Academy award for his collection of Dogri Gazals - Talkhiyan in 1991. 5) Padma Shri Award, India's fourth highest civilian honour for literature and education in 1990. 6) D. Litt. (Honoria causa) from the University of Jammu in 1994. 7) 59th Sahitya Akademy Fellowship, the highest literary honour conferred on him by Government of India for his contribution to Dogri language and literature. When the Central Government decided to include Dogri in the 8th schedule of Indian Constitution in December 2003, he had felt extremely happiness and said- This has ended the long struggle of the Dogri speaking people for a rightful place for their language. The Prime Minister, Atal Bihari Vajpayee has fulfilled his promise to Jammuites. Smt. Padama Sachdev, the eminent Dogri writer, has rightly said-Professor Ram Nath Shatri is the Bhartendu of Dogri language and literature. There is not a single person who is writing in Dogri now, has not been influenced by him. Not a single word is there in Dogri on which his stamp has not been registered with the help ofhis associates. He salvaged Dogri languge from the cultural debris and presented it in a very much revived and refreshed state before the Dogra people. Earlier the Dogra writers were writing in other languages, perhaps taking Dogri to the language not fit for literary composition." Am eminent Oriya poet and ex president of Sahitya Akademi Said" There are a few in India and elsewhere in the world who excel in so many areas of literature. When this great piller of Dogri expired on 8th March 2009 all the Dogri lovers were shocked. Prof. Ram Nath now though is no more in this mortal world he will be living in his writings and works done for the advancement of Dogri for all times to come. Apricot (Prunus armeniaca), locally known as "chulli," is one of the most nutritive, delicious and commercially important fruit crops of Ladakh. It has a wide range of distribution in different parts of Ladakh with particularly abundance in Sham areas (lower Ladakh) including Dha-Hanu, Garkhon, Skurbuchan, Domkhar, Wanla, Khaltse and Timosgang. Apricot in Ladakh, is believed to have been introduced a century back either from China or Central Asia. Since then, apricot has become one of the most preferred and commercially cultivated fruit crop of Ladakh and has become an integral part of the people there. Apricot, being a unique, tolerant and highly stable plant, can grow exuberantly in wide range of jagged sandy soil, having very low nutrient and moisture content, in the Cold desert of Ladakh. Luxuriously adapted in the extreme environment here in Ladakh, the apricot tree can attain a height of about 4-7m bearing heart shaped leaves, and produces flowers in spring and friuts in summer. With the onset of breezy spring, these trees overcome the long terrible winter dormancy and start producing young healthy leaf buds, and by the month of April-May they produce beautiful white or pinkish flowers that not only ensures the continuity of their population but also give a unique look to the sandy desert of trans-Himalaya. By the month of August-September, they start producing yellow-orange, rounded or oval shaped fruits that are juicy, sweet taste with peculiar apricot flavour. There are many varieties of apricot grown in Ladakh, which differ from one another in taste (sweet, bitter, sour), size, shape and physical appearance. Some of these varieties include Halman, Laktse-karpo, Safaida, Khanteh etc. Halman and Laktse-karpo are the most preferred one for commercial purpose. Both, the fruit and kernel of apricot is believed to be highly nutritive and consumed as either fresh or dried. They are known to possess a good amount of vitamin-A, vitamin-C, potassium, calcium, iron, carbohydrate, amino acids and sugars. Apricot has been consumed by the people of Ladakh for decades. It has became an integral part of the traditional culture of people here. Local people serve dried or fresh apricot as an excellent dessert, particularly on traditional festival occasions. During the chilly winters, when people prefer to remain indoor, dried apricot fruits make an excellent eatable that compensates the long cold winter, especially for children who use to fill their pocket with dried fruits and enjoy themselves. In entire Ladakh, a farmer practices one of the best and oldest method of fruit preservation and storage by open sun drying. The local people, particularly women and children, collect the fully ripend apricot in a large traditional basket (locally known as Tsepo) and wash them under running water to remove the dusts, and then spread on the roof top for drying under open sun light. The fruit are dried either as whole fruit (locally known as Fating) or seed are separated before drying, and the dried fruit without seed are called Chulli skampo. During the sun drying process, the fruit loses its natural colour and turns dark brown. This is the major drawback of traditional method of sun drying in Ladakh. However, at present, the Ladakhi farmers have adapted several improved methods of drying including treatment with sulphurdioxide and use of polyhouse apricot drier. These methods are believed to reduce or prevent the browning of fruits. From the commercial point of view, apricot has been the major source of income for many Ladakhis who are engaged in cultivation and marketing of this fruit. Halman and Laktse-karpo are the two prime varieties that have a good demand in the market and are profitably sold @ Rs 200 - 250 per kilogram. Besides, the kernel of apricot is also consumed and marketed by locals. The seed with sweet kernel is consumed as dry fruit and make a good market price of Rs 100-150/kg while the seed with bitter kernel are used for oil extraction. The apricot oil (locally called tseghumar) is a multipurpose oil with a peculiar apricot flavour and is sold at a remarkable price of Rs 300-500 per litre. Traditionally, the oil is extracted from the semi-roasted kernels by crushing them in a large wooden mortar (locally termed as Thorn), followed by heating and compressing them with few drops of water on a flat stone(called as Tsigg). Besides, several other products such as apricot jam, squash, jelly and cake are being produced for commercial purposes. This is worth mentioning here that Ladakh is one of the major producer of apricot in India, but, at present almost 90% of the fresh apricot being produced in this cold arid region go waste and its market value stands abysmal. The prime reason for such debacle is the lack of proper network for processing and supplying apricot products in Ladakh and elsewhere in India. The local apricot growers, though, have the knowledge of cultivation and drying, but, they are devoid of any modern technical skills for proper preservation, storage, transportation and marketing of apricot products. This results in a huge less not only to the poor farmers but also to the economy of Ladakh in general. Keeping in view the major challenges of apricot processing and marketing, the people of Ladakh particularly farmer and young generation needs a deep understanding and awareness of apricot production and commercialization. Defence Institute of High Altitude Research (DIHAR) has made a significant research on apricot propagation, processing and commercialization in Ladakh. In fact, several such scientific research is needed to overcome the major obstacle faced by apricot growers and marketers. . If this God gifted natural resource of Ladakh is to be commercialised and made a potential source of income for thousands of poor Ladakhi farmers, then the local government and non-government agencies, who seem to be complacent, needs to recognise the potential of apricot and go hand in hand with farmers.